Ramaphosa’s ANC intent on burning the country to the ground as they lose the support of South Africa - News around the clock!! We have gathered evidence of the ANC’s coordinated campaign to literally burn parts of South Africa, particularly where the DA governs. This is indicative of an organisation that is becoming desperate as the writing is on the wall. South Africans are increasingly rejecting the ANC’s 25 years of empty promises and corruption that has stolen from our people. South Africans want change. The ANC is running scared of the DA and the inroads the Party has been making across ANC governed areas, as well as the significant change and development we are bringing to the 33 areas we govern on behalf of and for 15 million South Africans in Gauteng, Western Cape, Limpopo and the Eastern Cape. These attacks are intended to undermine the progress being made in DA governments. Rolling protests are being planned in order to incite violence and shut down communities, in pursuit of the ANC’s narrow political objectives. It is now clearer than ever that the ANC would rather create chaos, instability and disrupt peoples’ daily lives than accept that they are losing support. Worse, despite the violence and chaos instigated by his party, ANC President Cyril Ramaphosa has remained mum. His silence is an endorsement of the acts committed in his name and that of the ANC. Where we govern, we have cleaned out the rot we inherited from the ANC. In Tshwane and Johannesburg alone, we inherited broken metros that could no longer deliver to the residents because money was being blindly looted. We have since started to deliver basic services and turned these governments arounds. The ANC cannot stand this progress. It terrifies them. The fact that in the Western Cape, where we govern, we have managed to create the most amount of jobs across the country and run a clean government is a key proof point for the DA. The DA is undeterred by the ANC’s fear tactics. Our commitment remains building One South Africa for All and the delivery of services to the people of South Africa and putting the people of the country above petty politics. We will continue putting South Africa first where the people have placed their trust in a DA government. 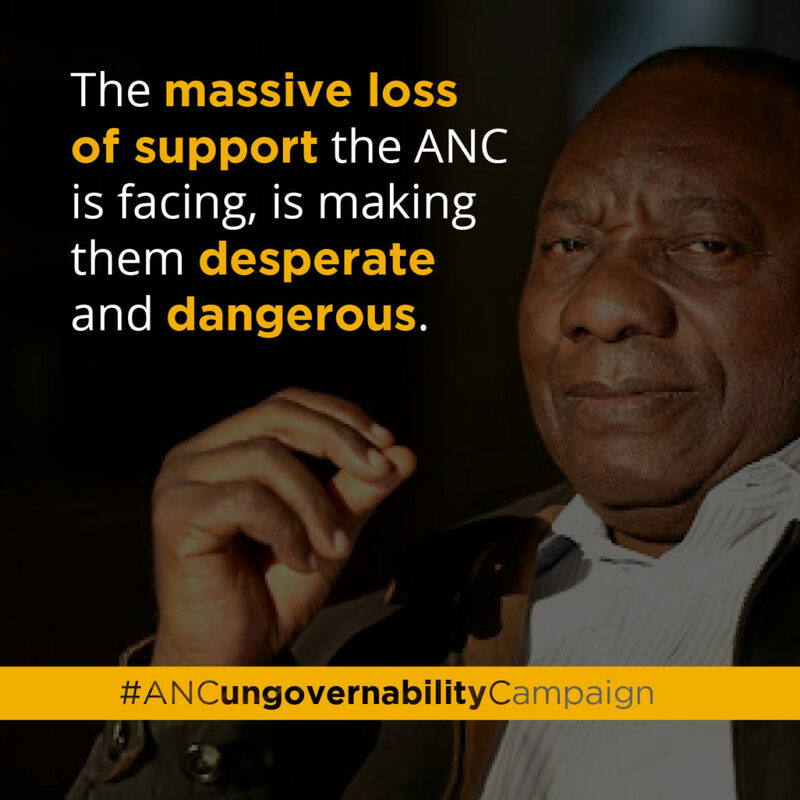 It is clear that the massive loss of support the ANC is facing in a month, is making them desperate and dangerous.